Hosted by the the Westbeth Gallery this past summer, Artifacts & After Effects, was a two-pronged exhibition that included a mini-retrospective of artifacts and documentation from the Fellowship for Utopian Practice, as well as live events that re-staged some portion of the original Fellowship projects. Culture Push helps artists push their practices into new realms, and enter a conversation with a larger public, nurturing interdisciplinary and boundary-pushing projects. 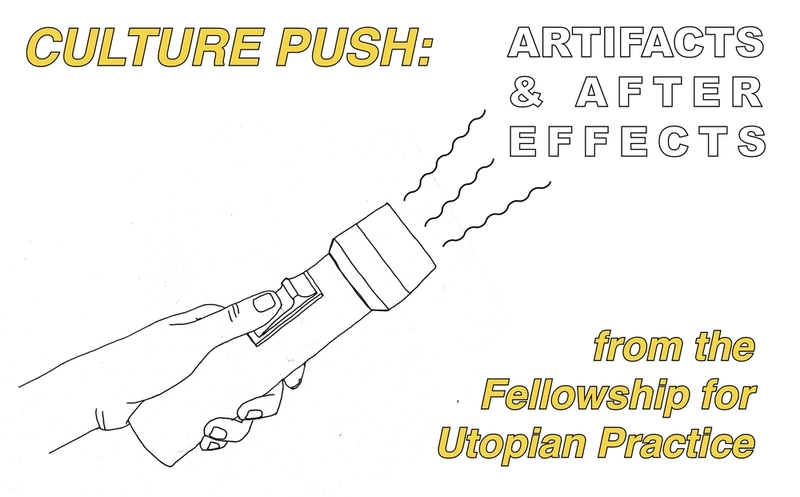 The Fellowship for Utopian Practice supports artists as they develop strategies for civic engagement and stage projects that are experimental, ambitious, and politically thoughtful. The Fellowship’s unique approach to art and social practice is best experienced by directly engaging with past and current Fellowship projects. For more information about the individual pieces in the show, visit the artists' Fellowship pages listed below. Visitor quote: "I've never seen anything like this. I love the sense of community within Culture Push." Alicia Grullon presents ephemera from Percent for Green and leads interactive workshops where the public is invited to draw connections between urban poverty, sustainability, and diversity. Aricoco displays drawings and paintings from preliminary studies for PIPORNOT, her series of workshops that invite participants to consider how to make a temporary community under emergency circumstances. Barrie Cline shows a light box sculpture containing text on solidarity from one of the members of the Workers Art Coalition, a collective of union laborers whose collaboration grew out of Usa tu celular. Chloë Bass presents an installation of The Department of Local Affairs, wherein visitors are invited to participate in an activity that seeks to re-shape one's sense of place and site in the everyday. Go! 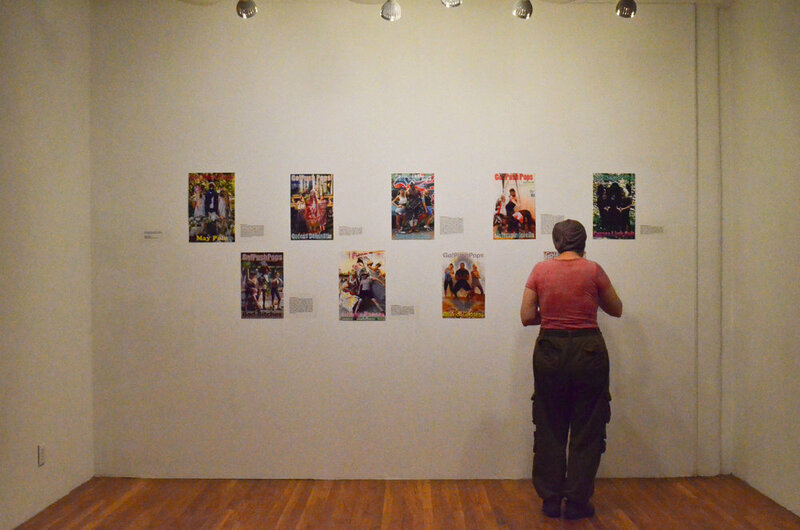 Push Pops display posters from Diamond Tribe, a series of creative movement and costuming workshops that work to empower low-income queer youth in their own bodies. Go! Push Pops, will also be performing with BEAT NYC on July 29th, the closing night of the exhibition. James Andrews presents a schematic map illustrating protest march routing and coordination. The map draws from his Fellowship project, Spatial Resistance, a series of workshops that consider the spatial dimensions of civil resistance. Jen Kennedy & Liz Linden display posters and copies of the New York Times Feminist Reading Group Yearbook, a publication presenting the varied feminist perspectives of reading group participants during a year of NYT Feminist Reading Group meetings. Lise Brenner presents an interactive installation inspired by her project, Vox Populi, which uses movement as a place-making tool for residents in the Dutch Kills neighborhood of Long Island City. Nancy Nowacek will present ephemera and an interactive postcard exercise drawn from her project, Citizen Bridge, which is working towards an effective way to build a pedestrian bridge to Governor's Island. Olaronke Akinmowo presents an installation drawn from the Free Black Women's Library, a mobile free library containing books written exclusively by Black Women. During the library's various one-day installations throughout New York, artists, poets, readers, and authors are drawn together in celebration of the literary legacy of Black Women. Sarah Dahnke presents a multimedia installation that displays text and artwork from Dwayne McKinnney, Michael Collier, Dushaan Gillum, Isreal Balboa and Jeremy Bukowski--the incarcerated individuals whom she has worked with through Dances for Solidarity. Weekly live performances that examine displaced time and space will bring to life the choreography written by her incarcerated correspondents. Victoya Venise presents artwork and three days of live events from five of the artists that she has worked with through Protect the Art BK. Artifacts & After Effects looks back at artists and creative practitioners that have developed work through the Fellowship for Utopian Practice over the past four years. The Fellowship supports artists who are working on the margins of traditional genres and with communities, voices, and ideas that have been pushed to the margins - made invisible via the machinations of city zoning laws and the lockstep of gentrification, the prison industrial system, historical erasure and censorship, and political suppression. This form of practice is not easy to classify or contain and rarely receives the institutional support or attention that it requires. This exhibition makes these voices and alternative forms of practice and engagement visible through a display of documentation, studies, interactive installations, and live events. Though the focus and medium of their work varies, all these creative practitioners share a spirit of experimentation and horizontal collaboration that was nurtured by the Fellowship. For many of these artists, the Fellowship served as an important launchpad or incubation chamber, giving them a sustainable working methodology that continues to inform their practice. About the Westbeth Gallery: The Westbeth Gallery is a nonprofit gallery operating on the first floor of the Westbeth Artists' Housing complex. It exhibits work of resident artists and independently curated exhibitions.